If you were only able to wear one makeup product at a time, what would it be? Usually I’d say concealer or foundation, but eyebrow pencil is actually a great answer. Even if you have nothing else on your face, filling in your eyebrows can make an instant change that makes you look more polished. The Lord and Berry Magic Brow eyebrow pencil is a slightly different type of eyebrow pencil as it actually contains three colours to create a marbleised effect for a more natural colour. The trio of colours comes with a dark shade, a mid-shade and light shade. They’re a bit like those funky rainbow pencils that everyone had as kids for creating awesome rainbow lines, but without all the bright fun colours and more browns, blondes and blacks. I have the shade Wonderful which contains white, mid-brown and very dark brown. It also comes in the shades Blondie and Brunette. In addition, the pencil also has a brush at the end to tidy those brows up and help to blend the pencil at the end. Use the brush side to comb your eyebrows before starting. Use the pencil to draw thin lines from the bottom of your brows to the top, as if you’re drawing on new hairs. Once done, use the brush to comb the brows again, blending the pencil to make it look more natural. Personally I try to use the darkest part of the pencil to initially fill in my eyebrows as it matches the shade of them perfectly, and then I use the three together to help make it look more natural. This works out better for me, but it will depend on your natural eyebrow shade. I find the Magic Brow pencil to be very creamy, which is great in the respect that it applies smoothly and easily with no tugging, but not so great in terms of how long the pencil is going to last you. It needs sharpening fairly often to keep it working at its best. I like the mix of three colours. I have quite dark eyebrows but light-mid brown hair, so if the pencil that I use is too dark then I can look very intense and serious. Not quite what I'm after! The trio helps to keep them the right colour that doesn't look out of place. Once on the brows, this pencil doesn't smudge. This is great as there is nothing worse than an eyebrow pencil that smudges throughout the day and gives you slug brows! The brush at the opposite side is a spoolie one and not comb-like (such as the Rimmel Eyebrow Pencil brush), which I find to be far better when working with eyebrows. The bristles are quite hard, but soft enough to blend out the pencil well. To me, the biggest downside of the Magic Brow pencil is definitely how quickly it wears down. Whilst it isn’t the most expensive eyebrow pencil in existence, I know of ones that cost less and that last longer. Overall though, I do like it. It might be a little odd to get used to the trio of shades at first, but I think that is more down to how you prefer to hold the pencil. If you hold it at sort of an angle, you will have more of one of the shades rather than a blend. At the same time though, this can actually be a good thing. For example, if you’ve over-filled a part of your brow, you can go over with the lightest shade and give it a quick brush and it’s like it never happened. If you are a fan of eyebrow pencils, this one is definitely worth a try. The marbleised tip is great at creating that natural, fuller eyebrow look. You can purchase the Lord & Berry Magic Brow eyebrow pencil for £10 from Look Fantastic or Birchbox. 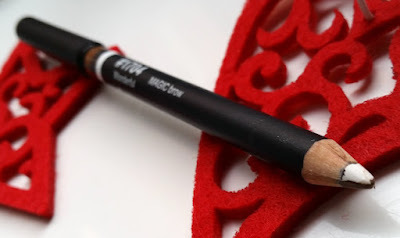 What are your thoughts on the Lord & Berry Magic Brow pencil? What’s your favourite eyebrow product? Have a fantastic Christmas everybody!